Space shuttle Enterprise is craned onto the flight deck of the Intrepid Sea, Air & Space Museum in New York City on June 6, 2012. This story was updated on June 7 at 9:33 a.m. EDT. For the first time in history, a space shuttle landed aboard an aircraft carrier, but instead of catching an arresting wire at high speed, the winged orbiter was gently lowered onto the flight deck by crane. 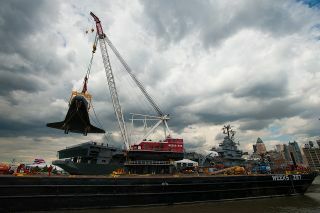 Space shuttle Enterprise, NASA's 1970's prototype for its now-retired spacecraft fleet, arrived at the Intrepid Sea, Air & Space Museum in New York City at 12:55 p.m. EDT (1655 GMT) on Wednesday (June 6) after a morning sea trek by barge from a port in Jersey City, NJ. The Intrepid, which is docked on Manhattan's west side, is a retired World War II aircraft carrier that is now used to house aerospace and maritime exhibits. The craning operation to deliver the 150,000 pound (68,000 kilogram) Enterprise on the museum's steel-enforced flight deck took about four hours to complete. Enterprise's arrival was the latest, and at least for a while, final leg in its journey to be displayed at the Manhattan museum, which included a flight on top of a NASA jumbo jet and a three-day trip by barge between the Big Apple and Garden State. With Enterprise now sitting on its flight deck, the Intrepid will begin work raising a climate-controlled, steel and fabric shelter over the shuttle, to protect it while its on display. Enterprise's river ride on Wednesday got underway at 9:45 a.m. EDT (1345 GMT) from Weeks Marine in Jersey City. The shuttle had been in New Jersey to switch barges. Enterprise was transferred from the barge that brought it from John F. Kennedy (JFK) International Airport last Sunday (June 3) to another, wider barge for its hoisting onto the Intrepid. During its move from the airport, Enterprise sustained minor damage to its right wingtip when it scraped up against a bridge's barrier. The shallow gouge left wear some of its foam mock heat shield tiles had broken off was partially camouflaged for its arrival at the Intrepid by a coat of black paint. The cosmetic damage was hardly noticeable as Enterprise floated by the Statue of Liberty and the World Trade Center on its way to its new museum home. The Intrepid had originally planned for the shuttle's sea trek to occur on Tuesday but poor weather conditions delayed loading the Enterprise onto a different barge for its arrival. Wednesday's weather cooperated, making for smooth sailing to Pier 86 at W. 46th Avenue and 12th Street in Manhattan. NASA's space shuttle Enterprise sails up New York City's Hudson River with the Empire State Building in the background while en route to its new home, the Intrepid Sea, Air and Space Museum on June 6, 2012. Soon after arriving alongside the Intrepid, Enterprise was prepared to be hoisted onto the museum's flight deck. A separate barge equipped with a large crane — the same crane that was used in 2009 to lift the U.S. Airways "Miracle on the Hudson" plane out of the water — was positioned between Enterprise and the Intrepid. To enable the lift, the shuttle was outfitted with the yellow metal sling that was used to hoist it on and off NASA's modified Boeing 747 shuttle carrier aircraft that delivered Enterprise to New York. The orbiter was lowered onto the deck so that its nose was pointed toward the Hudson River. This was the first time — and almost certainly the only time — a space shuttle has been displayed on an aircraft carrier, although the exhibit is only temporary. The Intrepid plans to build a permanent display home for the Enterprise to showcase the shuttle and enhance its other space exhibits and educational curriculum. Hundreds of enthusiastic people watched as the space shuttle Enterprise arrived at its new home: New York City's Intrepid Sea, Air and Space Museum, June 6, 2012. Enterprise was previously displayed at NASA's Kennedy Space Center in Florida prior to it being donated to the Smithsonian Institution in 1985. Before arriving at the Intrepid, Enterprise was exhibited at the Smithsonian National Air and Space Museum's Steven F Udvar-Hazy Center in northern Virginia for eight years. It was moved to New York City after shuttle Discovery inherited its place in the National Collection. Although Enterprise did not fly in space — it was instead used for a series of approach and landing tests in the late 1970s — it holds the record among NASA's shuttle fleet for traveling the farthest around the globe without ever leaving Earth's atmosphere. Enterprise was the only NASA shuttle to visit several countries in Europe while overseas for the 1983 Paris Air Show (it made its first flyover of New York while on its return to the U.S.). A year later it embarked on its first barge journey, being delivered to New Orleans for the 1984 World's Fair. Visit shuttles.collectspace.com for continuing coverage of the delivery and display of NASA's retired space shuttles.